The 54th annual Morocco Rose Festival kicks off on May 12th. The rose harvest is one of Morocco’s most cherished traditions so it’s fitting that the Moroccans host a three-day extravaganza to celebrate their beloved blushing blooms in the appropriately named Valley of the Roses. If I had to sum up Morocco in three scents, they would be the bright, jasmine-like fragrance of orange blossoms, the tempting aroma of exotic and familiar spices that lingers in the souks and the unmistakable perfume of roses. The various incarnations of the latter range from the actual roses themselves to decorative goods like potpourri and candles to beauty products such as soaps and lotions. The roses weren’t in full bloom during my pre-harvest visit, but I recall quite fondly how burgeoning pink buds dotted the Domaine de la Rosearie landscape in Asni. A six-hour drive from Marrakech, the Valley of the Roses comprises the Imgoun and Dades valleys that nestle into the foothills of the Atlas Mountains, just on the edge of the Sahara. In April the landscape transforms into a magnificent kaleidoscope of red and pink that culminates in the May rose harvest. The tiny village of El-Kelaâ M’Gouna hosts the time-honored festival which dates back to 1962, approximately thirty years after the French opened the region’s first distilleries. Visitors may tour these prominent facilities to see first-hand how and where the precious rose water, which serves both cosmetic and culinary purposes, and the prized rose oil are produced. The painstaking extraction process presses one mere liter of oil out of 60,000 roses resulting in just 1,500 liters of this hot commodity per harvest. Kicking off on 12 May, the Morocco Rose Festival attracts up to 20,000 flora enthusiasts eager to eat, shop, be merry and smell the roses. A rose-dedicated gallery showcasing the many uses of the flower stands among the 300 participating exhibitors and vendors. The vast souks sell everything that you could imagine–rose-related or not–such as lotions, oils, perfumes and potpourri as well as spices, jewelry, carpets, daggers, kaftans, henna, honey, almonds and more. A photo and video display demonstrate the roses’ history and local production methods. Attendees feast on traditional Berber fare and may partake in the live music and dance performances that round out the festivities, which are complete with a rose petal parade and beauty pageant to crown Miss Roses, a ceremony that started in 1983. 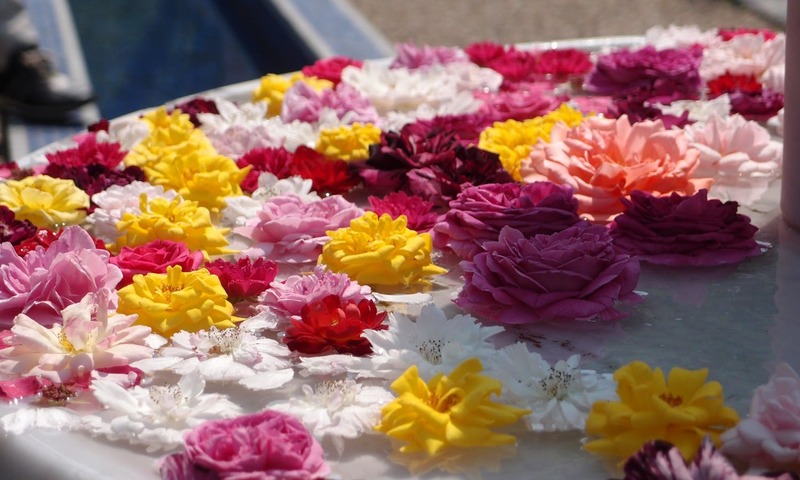 If the Morocco Rose Festival is on your bucket list, keep in mind that accommodations in El-Kelaâ M’Gouna fill up fast, but you can look to the nearby neighboring towns like Skoura and Ouarzazate.